For medium and larger homes. Produces enough volume for a multi bed/bath home. Handles 10-12 things at the same time with both pumps operating. Our Grundfos pumps are switchable between 115 vac and 220 vac. 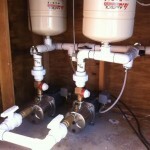 These pump systems often go on a small slab outside the tank preferably in a pump shed. The pump, pressure tank, hose bib and gauge are usually plumbed with PVC or can be welded up with rigid copper pipe. While these pumps are very reliable they require a shed or other weather protection. Meyer pumps are available at similar pricing. Installation Kit: 1.5” PVC ball valves and unions coming and going, manifold for gauge, controller, hose bib and pressure tank, all fittings and as pipe to and from the pump to stub outs at both the supply and output sides of the pump system. Does not include tie in piping from the water tank or to the house or the electrical hook up as those items depend on layout of each situation which varies. Dual install kits go up to $310 (and single install kits up to $155) on every single pump system. DC Pumps: Special order pumps low voltage DC pumps are available in 12 and 24 VDC). Very High pressure pumps. We offer 1.5 hp and 2+ hp pumps in 230 VAC and other controller systems for special situations and needs. Ultra Efficiency pumps: All stainless 115vac Stay-rite multi stage high efficiency pumps (offer higher volume and pressure then the Grundfos “jet type” water pumps at the same power use). Alternating pump Operation: Digital pressure controllers with a Master controller that operates the A pump then the B pump alternately and operates either pump if the other has any problems. Larger Capacity Pipe systems are available for higher volume pumps. Rigid copper welded systems are available.